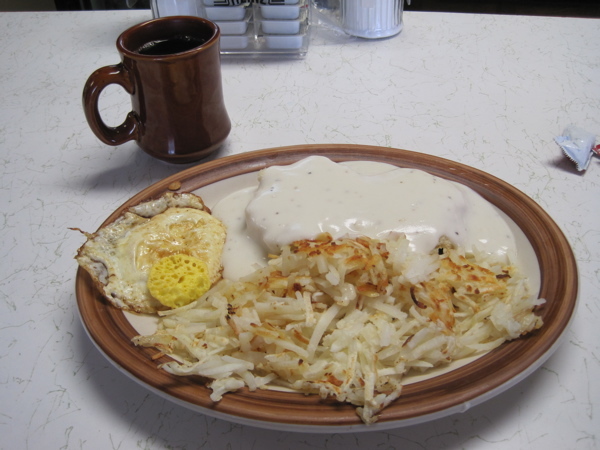 After a recent trip to Kimball, I did something I’d wanted to do for a long time: stop at Banner County Cafe. The cafe is perched on a hilltop on the east side of Highway 71 near Harrisburg, about 10 miles south of the entrance to Wildcat Hills State Recreation Area. It’s a popular place for truckers to stop, as it’s got two nice, long driveway entrances so they don’t have to turn around. 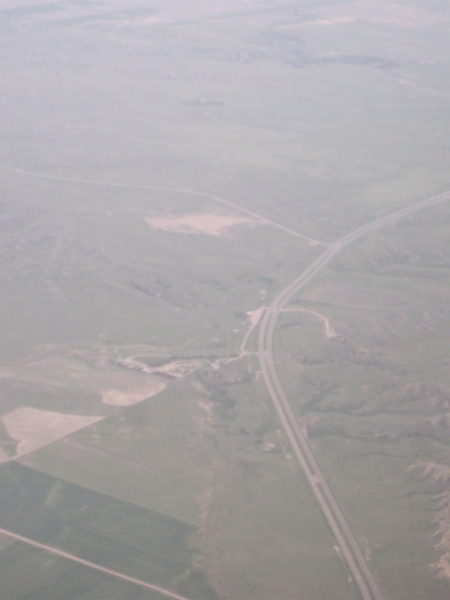 It’s that wide spot connected by dirt road on the left side of the highway in this pic, which was taken pointed southeast. Here’s what I ordered for breakfast: hash browns and biscuits and gravy (note: this was just plain white gravy, no sausage), plus a fried egg on the side. Ketchup comes in packets if you want some. Husband got a stack of four huge pancakes that kept him full for hours. The place is also a convenience store for the truckers and the (fewer than 1,000) folks who live in Banner County. There’s not a lot of commerce there. It mostly migrated south to Kimball and north to Scottsing over the years. I’d recommend stopping by the place on your way to and fro, or even after a hike in the Wildcat Hills. You don’t have to worry about taking a trip there only to find that they’re closed. The Banner County Cafe has a well-updated Facebook page! They have a website, too. Due to business being slow in the evenings we have made the choice to close at 5:00pm (Monday – Friday) This was not a easy decision for us to make but for business purpose we needed to. During the month of June we will be closed on Saturdays. Starting July 8th (Saturday) the new Saturday hours will be 7:00AM to 2:00PM. Bummer! I hope business picks up for them! 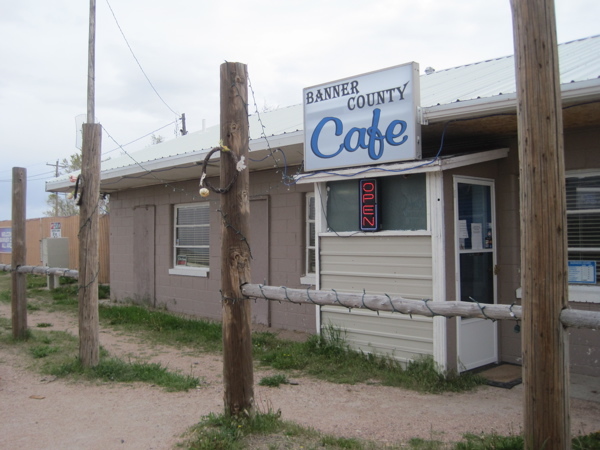 UPDATE: 8/2012 – the Banner County Cafe signs are gone. The place is closed. UPDATE TO THE UPDATE: This restaurant has been completely remodeled under new ownership and is now the über-cute Laura Lee’s Double L Country Store & Cafe. Here’s a post I wrote about it on another blog. And here’s a link to the cafe’s website. Great that you posted this–hopefully it’ll bring them more business. I heard this place is open now???? It’s not just open – it’s totally remodeled under new ownership and is a great place to visit. Thanks for flagging so I can update.